How can you make your porch inviting and cozy to make your guests look forward to entering? It’s very easy! A safe bet is fir tree and mistletoe wreaths and decorations on your porch – they are traditional and because of that always fashionable. Take some words like ‘Joy’ or ‘Merry’ and hang or put the letters near the door. 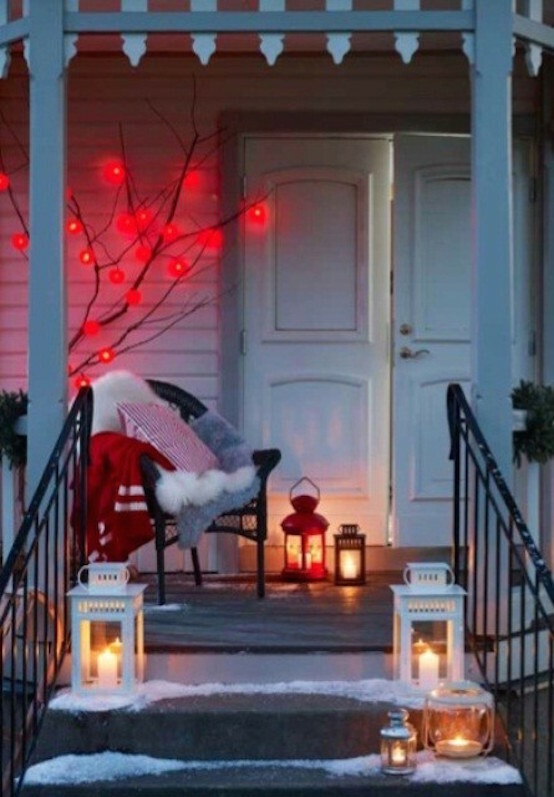 You may also hang some tree ornaments and garlands; lights and lanterns make the porch cozier. Choose the colors you like – red and green for a traditional porch, blue and white to remind of frost, or even pink – in case you like it. You may even place a small Christmas tree and some stockings outside – that would look amazingly sweet and cozy. Look for more inspiring ideas below.